I like how you get really into it once you watch the first 3 episodes.. Great show, with good animation to it and a wonderful and very interesting storyline you won't be disappointed or dissatisfied. Highly recommended everyone and anyone to watch it. I don't understand why it has been stopped, when it should be continued..
Just watch it, its fun!!! The animation is good and any CGI monsters are only briefly introduced and are not overbearing. Dont go into it with any adventure-fighting-tons-of-monsters-saving-world ideas and you will enjoy it. Just sit back and take it for what it actually is. A lot of reviews will say that the pacing is really slow after the 4th episode or how it takes a drastic turn. That is not what happens at all!!! The only fight with some action in it is in the first episode and lasts very briefly, after that its mainly exposition and even when embarking on the adventure and encountering fiends (of the horrifying CGI Chinese-new-year-themed kind) the action lasts very little. This show does not claim to be about action at all and gives no hints that it is looking at the first 4 episodes. What confuses people is the resemblance to standard adventure style anime, as such we are trained to expect a certain thing and when the show that spent 4 episodes with only two fighting scenes surprisingly (gasp) doesnt deliver more we are somewhat disappointed. Lets please stop pretending this was an Elfen Lied turned Idol show level twist. 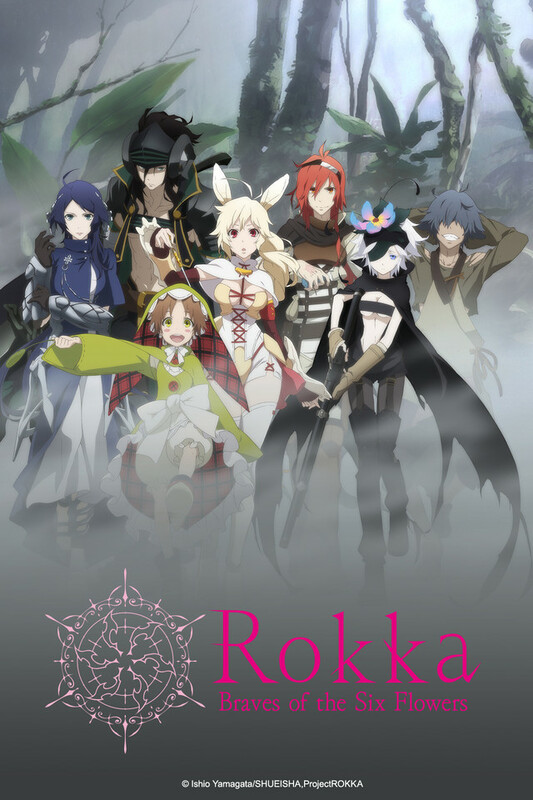 Rokka no Yuusha isn't an action show - it's a mystery, and it's the twists that draw you in. This anime adapts most of volume 1, which is a solid hook and decent mystery with enough hints early on that you might get close to the real answer. While the ending - adapting the start of volume 2 - was ill thought out considering no season 2 is in sight, it's still a solid show on its own. I would highly recommend checking out the LNs, there's official translations that are well done and eventually even plug up any holes in the story you might've thought of here. Preface I gave it till episode 5 before writing this, and obviously, this is only my opinion if you wanna watch it I say give it a crack who knows. overall I'd give it a very middle of the road anime, is enjoyable to the right group or maybe someone who isn't deep into anime but if you've watched anime for any length of time over a year this will probably be just ok for you but there may be a chance you can like it based on your own taste. The show started with good momentum but it wasted too many episodes on something they could've shortened to actually show you some good battle scenes. Instead the characters waste what seems like eternity bickering and whining. i would say wait for season 2 but that's not gonna happen. This anime series for me, was entertaining. It had good plot, and the twists were good. Because of that, the ending was complete garbage and left with a cliffhanger (like most anime alike), this anime was just a really long game of Framed and ended in a terrible way. the plot should was more or less okay before they got to the temple. After a while it became more frustrating than anything else. Questioning who was the traitor that was there and the proof they needed to redeem their innocence. While the premise sounds good, the artwork and whatnot are great. I say that this anime is misleading because while the Six Braves ARE out to put an end to the evil that has spread through the land the story basically turns into a Murder/Crime Drama. While it may have been the intention to set the story up for future seasons, they never came. So the story becomes pointless because nothing in it is ever resolved other then "In this season the one who is the actual bad guy is "_______". Its not worth anyone's time to watch it. Even if the animation isn't perfect I thoroughly enjoyed this anime. Not only are the characters each unique in appearance, personality, and abilities but there's an interesting plot to go along with it. I only wish the plot progressed more with the main story because in a season full of cliffhangers it feels bad to end the season itself with yet another cliffhanger. Can't wait for the series to continue! I really enjoyed this series and would recommend it to people who are new to the whole scene. This season leaves lots and lots of room for analyzing and theorizing so if you like animes that get your gears turning this one is for you! The characters also each have their own appealing personalities. Not to mention the art is also wonderful and pleasing to the eye. I am not an anime expert but I have watched and completed over 160 animes so I like to think that I can spot a goody. The story-line is unlike most animes that I have seen as well. For some reason it reminds me of 11 eyes even though they don't have that many similarities.